2081 - Photo: Bob Florence. Following its naming ceremony at York D9002 "THE KING'S OWN YORKSHIRE LIGHT INFANTRY" waits, for what appears to be, a light engine move to York engine shed on the 4th April 1963. The locomotive later worked the 1A16 10:00 King’s Cross - Edinburgh, "The Flying Scotsman" service forward from York. 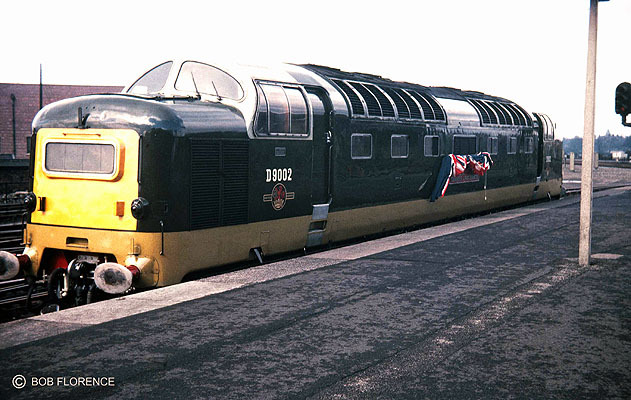 04/04/63 - 1A16 10:00 King’s Cross - Edinburgh, "The The Flying Scotsman" from York. (following naming). Deltic Deadline No.71: Page 19.